For island dreamers; Virtual saltwater to soothe the soul. But, the simplicity and snack-yness (is that a word?) of Buñuelos had me sold. I have no doubt that making traditional ones from scratch would be terrific, but to simplify, I opted for store-bought flour tortillas fried, and tossed in superfine granulated sugar and cinnamon. Seems this is a pretty common approach.. lots of recipes including this one. Now, for something to dip them in. The honey and chocolate just wasn’t fun enough… and I was still thinking about coffee. Then, this guy was staring at me. Maybe he winked? It’s true, he is from Mexico. We brought back the bottle of coffee goodness ourselves. Using a typical cream cheese base, Kahlua adds a sweet coffee flavor. Adding espresso powder to your liking let’s you control how strong the flavor is. The result is a light, creamy dip that paired perfectly with the Buñuelos. Leftover dip (of there is any) stores well in the fridge and is good with Nilla wafer cookies… it would go well with fruit or pretzels too for a sweet/salty taste. Sound good? My recipe is below. Give it a try. 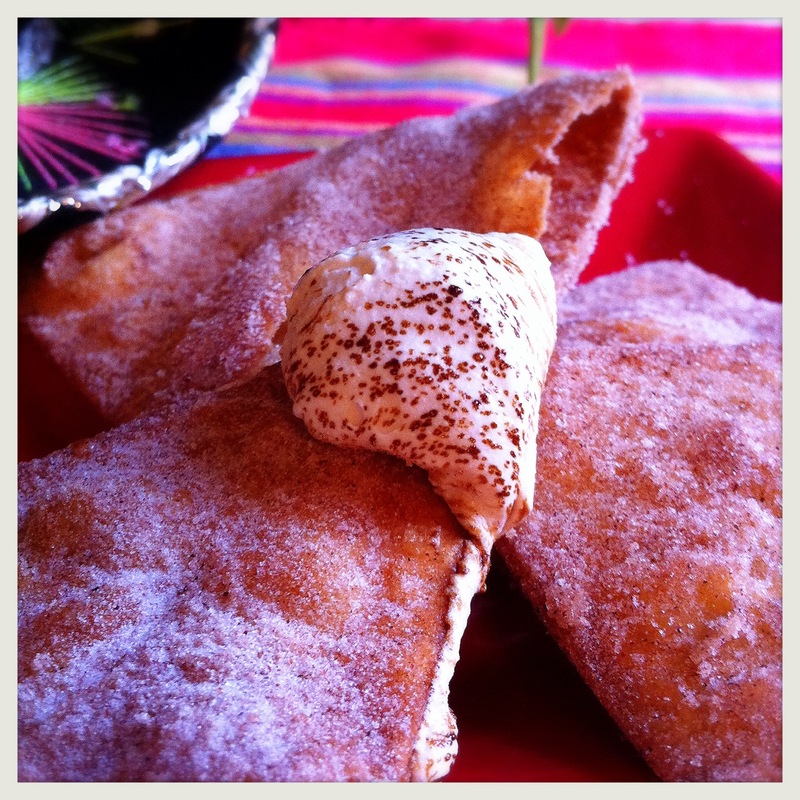 Flaky flour tortillas with sweet sugar and cinnamon coating. 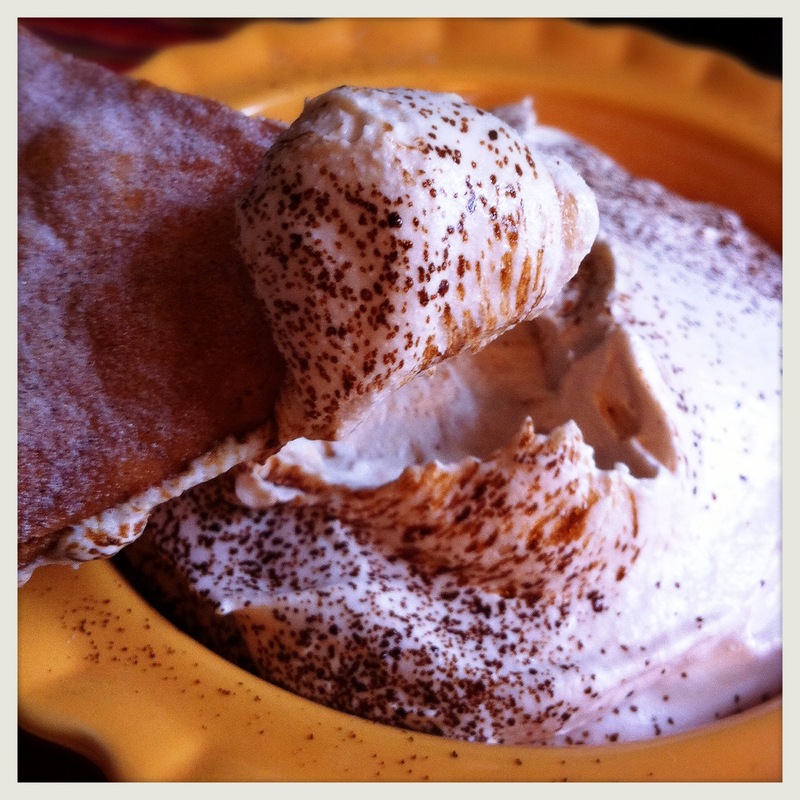 Creamy, cool, fluffy dip… sprinkled with espresso powder… because, why not? 1) Mix sugar and cinnamon to your liking in a bowl and set aside. 2) Heat vegetable oil or shortening in a skillet. Cut tortillas in half, and each half in thirds. Fry the cut tortillas, turning over when a light golden brown color is achieved. Transfer to brown paper bags on a cookie sheet to drain and cool slightly. 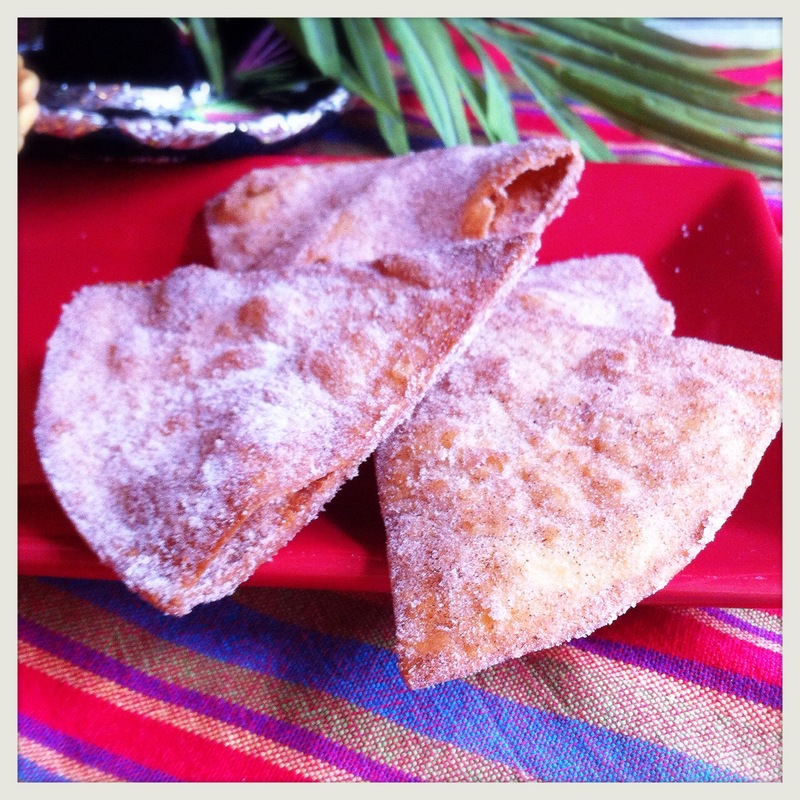 3) While still slightly warm, coat both sides of fried tortillas with the mixture of cinnamon sugar. 1) In a large bowl, beat together softened cream cheese and butter until light. 2) Add powdered sugar, salt, vanilla and liqueur. Mix well. Add espresso powder if desired. Adjust liqueur and espresso to taste. 3) Fold in whipped topping, mixing well. Chill for at least an hour, then stir again and transfer to your serving dish. Dust with espresso powder if desired. If you give the recipe a try let me know how it goes! The group at the party I attended really liked it… and Mr. Sandonthebrain enjoyed it even though he’s not a big “coffee guy”.